Maison Jéroboam is in St Estèphe, in the heart of the fabled Medoc vineyards, home to the greatest red wines in the world. With views across the vineyards of Chateau Phelan Segur to the beautiful Gironde estuary, the house is only five minutes from Chateau Cos d’Estournel and Chateau Calon Segur. Chateau Lafite and Chateau Mouton Rothschild are also only ten minutes away, so Maison Jéroboam makes an ideal resting place for wine lovers wanting to explore the home of claret. There are four double non-smoking rooms, each decorated in classic French style, with comfortable double beds. The property has a games room and a beautiful shady garden with a swimming pool. The village of St Estèphe has a restaurant and wine bar within walking distance. 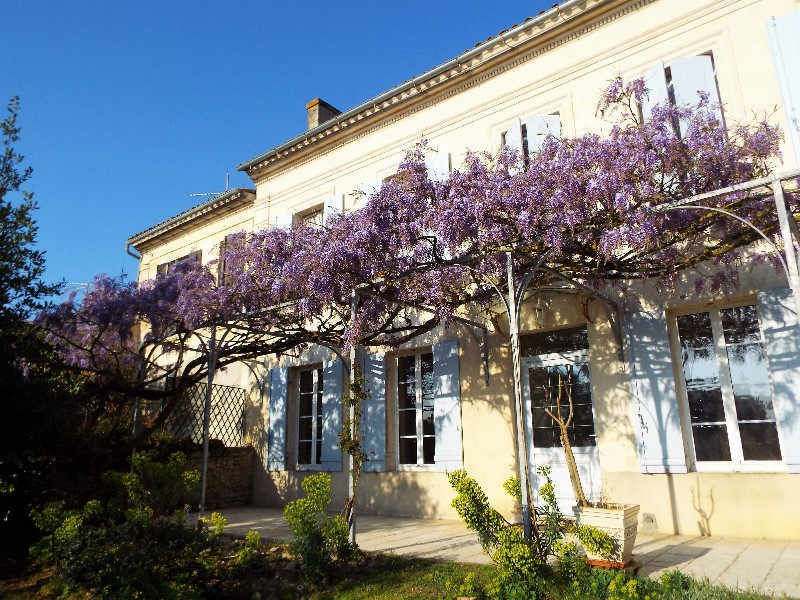 Several restaurants, bars and supermarkets can be found in Pauillac, ten minutes’ drive away. The city of Bordeaux is under an hour’s drive away, or can be reached by train from Pauillac. The Atlantic coast seaside resort of Hourtin Plage is 40 minutes’ drive away. There are ferries to Blaye (from Lamarque) and Royan (from Le Verdon) giving good access to the right bank, Cognac and La Rochelle. Accommodation is available for groups of up to 8 (double occupancy), all year round. £70 per room per night (plus local taxe de séjour). Evening meals available - £25 per head including wine. Location - The pavillon de Margaux is located on the way into the village of Margaux and overlooks the vineyards of Château Margaux. Only 30 minutes from Bordeaux city. Property - An attractive 19th-century residence that is now a 3 star hotel with 14 bedrooms, restaurant and cellar. Comments - a small hotel (this is in the village so very convenient for browsing the wine shops - taking a walk to see Chateau Margaux etc). Location - Located in the médoc wine area 75 kms from Bordeaux city, Hôtel Rollan de By is situated on 85 hectares of vineyard on the edge of the village of Bégadan. This 4 star Gironde hotel has a tranquil vineyard location and only 3 km from the shores of the Gironde Estuary. Only 70 minutes from Merignac airport Bordeaux. Property - a recently renovated 18th-century Carthusian monastery. Hôtel Rollan de By is a 4 star boutique hotel with 6 elegant bedrooms in tones of pearl gray and taupe, giving them a quiet, delightful atmosphere. Comments - For lovers of the Medoc wine area this charming boutique-hotel offers a quality experience, plus a vineyard experience with daily winery tour and wine tasting. Location - Located just 3 kms from St. Emilion village, Le Relais de Franc Mayne is situated on 7 hectares of vineyard. Only 40 minutes from Merignac airport Bordeaux. Property - A boutique hotel with 9 rooms with unique and different decor in each room, elegant dining room and tasting vat room. Comments - For lovers of a wine environment this charming boutique-hotel offers a quality experience. Location - located on the outskirts of the small but bustling village of St Christoly, Chateau Bavolier is situated on 2 hectares of ground. 10 minutes drive to Blaye and only 30 minutes from Merignac airport Bordeaux. Property - A charming 18th-century Louis XVI chateau, it is furnished throughout with beautiful restored antiques, this chambre d'hote with 2 rooms has unique and different decor in each room and elegant dining room.